Fishes print. Elasmobranchiis. Sharks, rays. 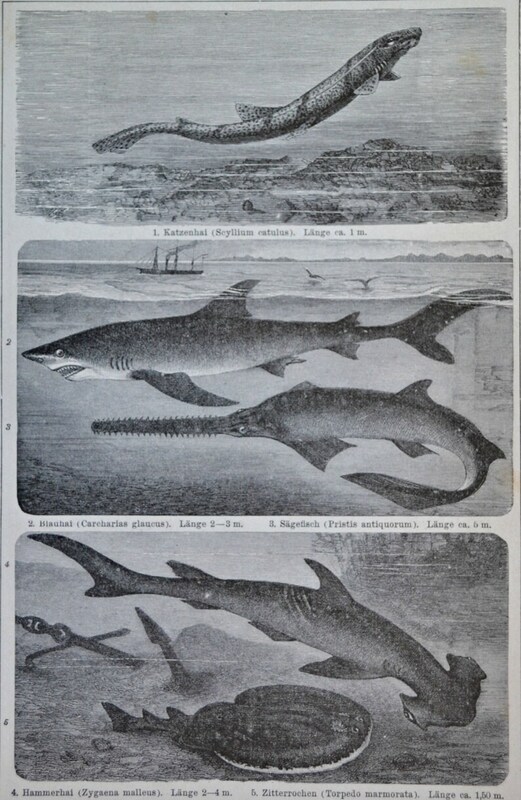 Natural history engraving. 1901. Old book plate. 114 years lithograph.9'6 x6'2 inches. Elasmobranchii is a cartilaginous fish, that includes the sharks and the rays and skates. 114 years old print. Book plate print. Published by the Institute Bibliographic of Leipzig in 1901. Original, not a copy . Slightly damp patches visible on pictures. New world monkey. Natural history engraving. 1901.Old book plate. 113 years lithograph.12'1 x 9'8 inches. Birds print. Goatsucker, Java swift, oilbird. 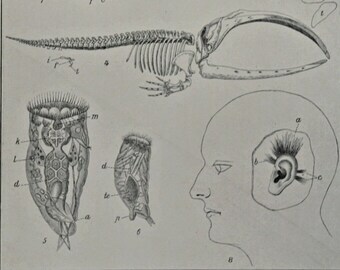 Natural history engraving. 1901. Old book plate. 114 years lithograph.9'6 x6'2 inches. Prehistory utensil print. History engraving. 1901. Old book plate. 114 years lithograph.9'6 x6'2 inches. Antelope illustration. Zoology print. Natural history engraving. Old book plate,1901. 113 years lithograph. 6'2 x 9'8 inches. Holy Roman Emperor badges's print. History engraving. 1901.Old book plate. 113 years lithograph.9'6 x6'2 inches. Anteaters print. Natural history engraving. Old book plate,1901. Fauna illustration. 113 years lithograph. 9'6 x 6'2 inches. Mongooses and civets print. Natural history engraving. Old book plate,1901. Fauna illustration. 113 years lithograph. 9'6 x 6'2 inches. Insectivorous illustration. Zoology print. Natural history engraving. Old book plate,1901. 113 years lithograph. 6'2 x 9'8 inches. 17th and 18th century clothes print. History engraving. 1901.Old book plate. 114 years color lithograph.9'6 x6'2 inches. 16th century clothes print. History engraving. 1901.Old book plate. 113 years color lithograph.9'6 x6'2 inches. Vestigiality. Evolution. Vestigial structures. Old book plate, 1901. 117 years lithograph. 9'6 x 6'2 inches. European Russia hydrographic map. History engraving. 1901 print. Old book plate. 113 years lithograph.12'1 x 9'6 inches. Middle Ages clothes print. History engraving. 1901.Old book plate. 113 years color lithograph.9'6 x6'2 inches. Artificial fish breeding print. Ancient aquaculture. 1901.Old book plate. 116 years lithograph.9'6 x6'2 inches. Vulture's print. Ornithology. Natural history engraving. Old book plate,1901. Antique illustration. 113 years lithograph. 9'6 x 6'2 inches.